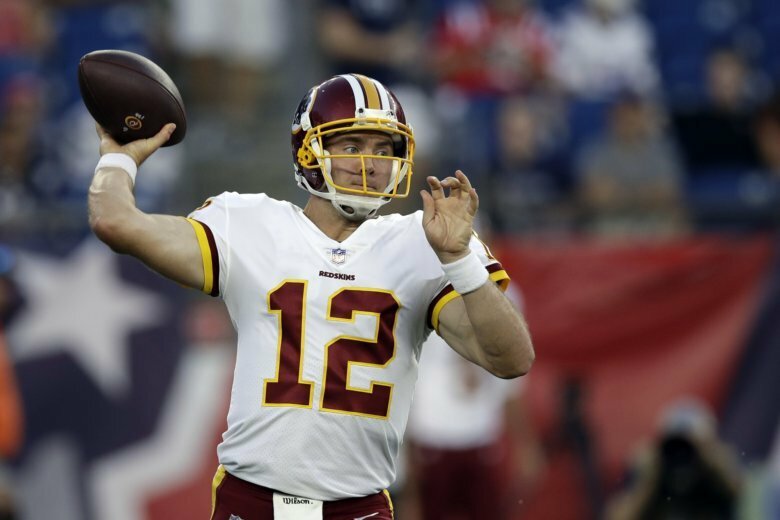 ARLINGTON, Texas (AP) — Colt McCoy silenced his phone knowing he was coming back to his home state for his first NFL start in four years, in the stadium where he helped lead the Texas Longhorns to a shot at a national title as their star quarterback and where he last won a game as a pro. The longtime Washington backup also knows what’s most important as he takes over following Alex Smith’s season-ending leg injury . The Redskins (6-4) can control the NFC East by beating the rival Dallas Cowboys (5-5) in the most traditional of Thanksgiving games Thursday. McCoy is 2-0 at AT&T Stadium, beating Nebraska for the 2009 Big 12 championship and a spot in the BCS championship game, which Texas lost to Alabama when McCoy got hurt early. The small-town Texas kid beat the Cowboys five years later, completing 25 of 30 passes for 299 yards in a 20-17 overtime win for the Redskins. He’s 32 now, and hasn’t started since the last of three straight defeats late in the 2014 season, a little more than a month removed from that win over the Cowboys. McCoy, a third-round pick by Cleveland in 2010 after that title-game loss to the Crimson Tide, has a career record of 7-18. McCoy is in his fifth year as Washington’s backup and has played just four games over four seasons, including when he replaced Smith in the third quarter of Sunday’s 23-21 loss to Houston. A potential winning drive stalled near midfield, and Dustin Hopkins’ 63-yard field goal try fell short with 3 seconds left. “It’s been a while since he’s played in a significant game. That’ll be the challenge,” coach Jay Gruden said. Dallas running back Ezekiel Elliott has been waiting for another Thanksgiving game since he had to miss last year on his six-game suspension over domestic violence allegations. In his Thanksgiving debut against the Redskins two years ago as a rookie, he jumped into the giant Salvation Army red kettle after a touchdown in a 31-26 Dallas win. The Cowboys have a chance to tie the Redskins for the division lead thanks to their first winning streak of the season, a pair of victories on the road after they were winless in their first four away from home. Washington could get a major boost if any combination of left tackle Trent Williams, running back Chris Thompson, wide receiver Jamison Crowder and cornerback Quinton Dunbar can return from lengthy injury absences. Williams just needs to feel comfortable blocking after surgery for a dislocated right thumb, and Thompson said his injured ribs feel markedly better this week. Dunbar, who’s dealing with nerve damage as part of a shin injury, feels “pretty close” but isn’t sure if he’ll make the problem worse. It just so happens that Elliott’s season high in touches — 30 in a 22-19 win over Atlanta — came on the Cowboys’ annual short week. In road wins over the NFC’s past two Super Bowl participants in Philadelphia and Atlanta, Elliott had 55 touches (42 carries, 13 catches) for 388 yards from scrimmage and three touchdowns. Part of the Redskins’ challenge in helping McCoy succeed is getting Adrian Peterson going on the ground. Peterson had just 16 carries for 51 yards in the loss to Houston, but ran for two touchdowns and is looking forward to playing back in his home state of Texas. The pressure’s on Peterson and the rest of Washington’s running backs to produce in the running and passing games. The former Oklahoma standout had 99 yards in the earlier win over the Cowboys. Dallas rookie receiver Michael Gallup is expected to play after rejoining the team Wednesday. He stayed behind with his family after getting the news following the win over the Falcons that his brother died by suicide. The Redskins, who haven’t allowed a 100-yard rusher, held Elliott to 33 yards in a 20-17 win in the first meeting. It’s the second-lowest total of his career. Both teams are in the top five in scoring defense and in the top six in rushing defense.